The kids are back in school, we have left the crowds and congestion of the northeastern states and have reached the Blue Ridge Mountains of western Virginia and North Carolina. Cooler temperatures, clean mountain air and a slower pace as summer slowly winds down. We entered the Blue Ridge Parkway near an area known as Meadows of Dan and drove south to Galax, VA. Here we parked at the Cool Breeze Campground. This area is known for the unique style of music that was born here and has been passed through generations. Galax calls itself the “World’s Capital of Old Time Mountain Music”. 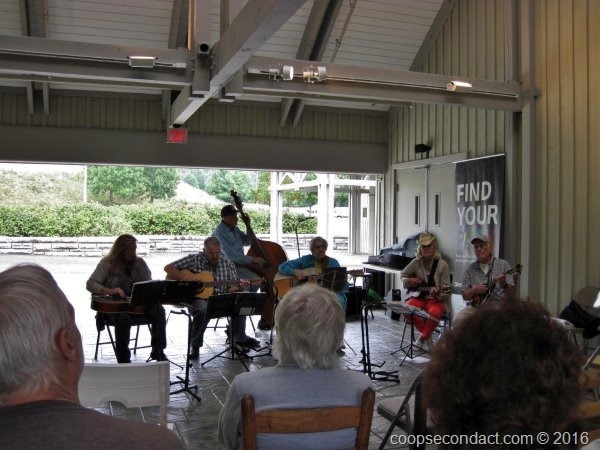 The nearby Blue Ridge Music Center celebrates this music and has live performances every day between 12:00 and 4:00pm. We visited the music center on a Friday when they have an open jam session with a variety of local musicians performing. The New River Trail State Park is a 57 mile linear Virginia state park that follows an abandoned railroad right-of-way which parallels the historic New River. The New River is considered to be one of the oldest rivers in the world and one of the few that flows south to north. We accessed the park in Galax and hiked a portion of this beautiful trail. If you are a big enough fan of Andy Griffith, you may or may not know that he was born and raised in Mount Airy, NC, which was about 25 miles from our campground. The town of Mayberry is largely made of pieces of Andy’s childhood in Mount Airy. 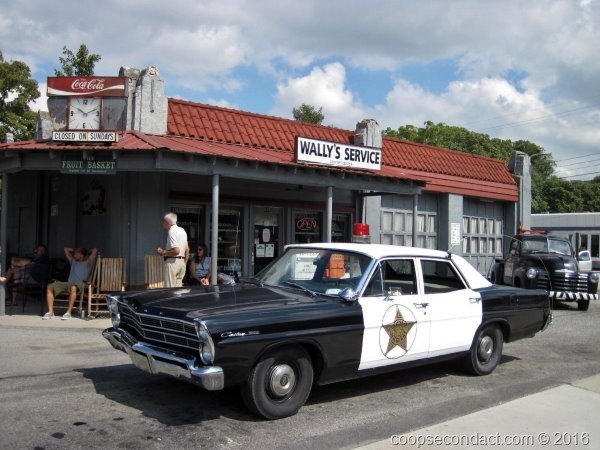 The town has built many of the well known Mayberry locations from the television show such as Wally’s Service, the courthouse and Floyd’s Barber Shop. You can take a tour of these sites in a squad car like the one used by Andy and Barney on the show. Of course, you must also check out the Andy Griffith Museum. Before Mount Airy was known as the home of Andy Griffith, it was known as Granite City since it is home to the world’s largest open faced granite quarry. The North Carolina Granite Corp harvests about 2,000,000 feet of granite from here every year. This white granite can be found in structures around the world. They have been removing stone from here since the mid-1800’s and expect to be able to continue to do so for several hundred years into the future.